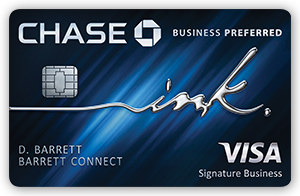 One of the credit cards that I’ve been bullish on lately for travelers and/or small business owners is Chase’s Ink Business Preferred card. While the card is technically meant for small businesses, one does not need a registered business to apply. (More on that below). YeahThatsKosher may earn a referral credit for the links used on this post. 80,000 Ultimate Rewards (UR) points signup bonus after spending $5,000 on purchases in the first 3 months after account opening. UR points can be leveraged on the Chase site for flights and hotels, or be transferred to a number of travel partners. When booking through their travel portal they can be redeemed at 25% more than redeeming elsewhere. Cell phone protection – Get up to $600 per claim in cell phone protection against covered theft or damage for you and any cell phone listed on your monthly cell phone bill when you pay it with this card. Trip cancellation protection – If your trip is cancelled or cut short by sickness, severe weather and other covered situations, you can be reimbursed up to $5,000 per trip for your pre-paid, non-refundable travel expenses, including passenger fares, tours, and hotels. Purchase protection – Covers your new purchases for up to 120 days against damage or theft up to $10,000 per claim and $50,000 per account. Extended warranty – Extends the time period of U.S. manufacturer’s warranty by an additional year, on eligible warranties of three years or less. Auto Rental Collision Damage Waiver – Decline the rental company’s collision insurance and charge the entire rental cost to your card. Coverage is primary when renting for business purposes and provides reimbursement up to the actual cash value of the vehicle for theft and collision damage for most cars in the U.S. and abroad. Using a business card for your personal spending will lower your personal debt-to-credit ratio, which in turn will help raise your personal credit score. Also, applying for a business card will not take a hard pull on your personal credit, even if you use your social security number in the application. Reasons #6-9 are great perks that I also get with similar cards from American Express, like the SPG (personal or business) card, but it is a few of the first reasons that make this card unique. 80,000 bonus points as a signup is one of the richest you will see today, and UR points are valuable and very flexible, allowing you any number of options for redeeming for travel. Triple point earnings on travel and telecom bills are both great ways to continue to earn UR points at a faster clip. I love reason #5, the cell phone protection. Any cell phone on a plan you pay for is automatically protected from damage or theft, which is a big deal for most people. This card comes with an annual fee of $95, which, when you take into account all of the benefits above, is entirely worth it. All of the perks listed above have terms & conditions that you should get to know once you have the card. It is listed on the application site. Using your social security number as the Tax ID number. Using a name for a business that you create. It can be your ‘consulting’ company that you’re just getting off the ground and need a business card to help separate your purchases. They may ask to discuss the new business and it’s important to be upfront that you’re just starting something. It does not need to be an established or registered business. Speaking to Chase reconsideration line. If you are not approved at first, you can proactively call them after you apply and be prepared to answer a few questions about your finances and why you’re seeking out this card (listing the perks helps). Bills should be paid in full each month in order for this to make sense financially.